that is not intended to make us rejoice." 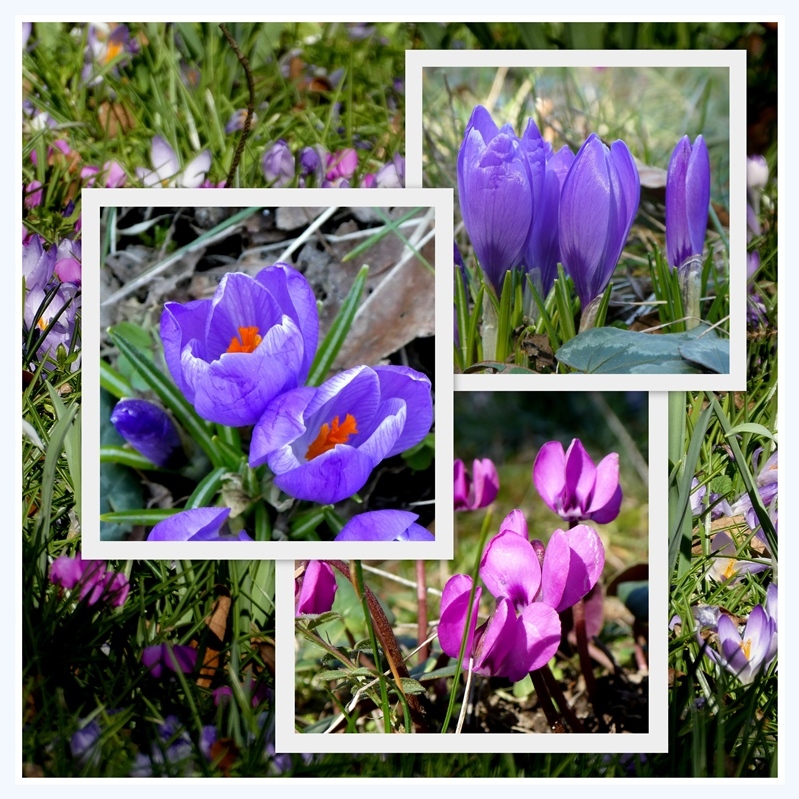 The crocuses and cyclamen that appeared before our great snowfall three weeks ago have recovered remarkably well. These bright days, full of cold sunshine, lift my spirits and give me energy. Our weekend was a quiet one as Tim arrived home from a business trip on Friday night with a bad cold. Lots of soup and hot lemon tea are on the menu. I made a carrot soup with ginger, onion, and garlic, all blended together that was quite delicious. The weekend was also a bit of a technology jolt for me. I've been avoiding getting a new phone because it's wasteful to replace one every two years, and because I despise fiddling with getting technology set up. On Saturday I put on my big girl pants and did the deed. It's another I-phone, not the latest by any means, but with more storage than my former phone. The salesman helped me transfer everything over, however, at home I had to sign into all my accounts once again. Passwords! Too many passwords! Frustration compounded! We're planning a trip to Europe this summer and I decided that I wanted a smaller camera to slip into my pocket rather than take my mirrorless camera with interchangeable lenses. I did some research and chose another Panasonic camera. It's well-rated, and the learning curve is small as it's very similar to my larger camera. It arrived on Saturday. What I didn't expect was the incredible zoom it has. The first photo, of the Sparrow, was taken at its full extent, and I can see that without a tripod, the quality is poor. Technology can be amazing and frustrating at the same time! Tim felt well enough to keep our plans for dinner with new-ish friends last night. Six of us sat around the table getting to know each other better. I made White Chicken Chili shared by Penny from Enjoying the Simple Things several years ago. I make a few adaptations and it's become a favourite around here. What little things have gladdened your heart recently? Hello, Your carrot soup sounds yummy and I love White Chicken Chili. YUM! Pretty captures of your yard birds. The crocus are beautiful. A trip to Europe sounds awesome. Happy Monday, enjoy your day! Wishing you a great new week ahead! You have some lovely birds in your area. I am glad you enjoyed the white chicken chili! Glad to hear your husband is feeling better. I envy you your upcoming trip to Europe! Thanks for the shout out. Your new camera sounds great - and the pix of the robin and junco are so good - I love both those birds. Enjoy your new phone also Lorrie - i have the iPhone 7+ and find it takes really good photos, but I still like having more contact with a proper camera, especially for close ups. We'll be ahead of you I think for Europe, going in May, just England on this trip. Sorry Tim brought a cold home and hope he will be well soon - take care of yourself too! Not enough to even mention, but I have enjoyed my visit here, though I am certainly sorry to read about Tim’s cold. Hope that, under your care, he will kick it in record time. Oh, that's neat to hear more about your trip AND your new camera. I'm always interested in a small camera that I can carry in my bag. Love the bird pics and the chili sounds yummy. Hope Tim feels much better soon! Hugs! I cant cope with technology! My phone is around 15 years old, but it works, and I cant bear the thought of changing it. How pretty your tulips are, they do lift the spirits, dont they? glad hubby is feeling better--you are a great nurse!!! I have to agree about technology! But, it's the world we live it. I do hope your camera is what you need for your trip. Your photos are so nice. ...I'll be sticking with flip phone, I'm not smart enough for a smartphone. I can sympathize with the passwords pain. I'm a laggard when it comes to technology. I only upgraded my previous phone (of 7-8 years) because I accidentally washed it in the washing machine. Whoops! I am not a fan of new technology either and have avoided it for a long time, but like you needs must. I am thankful that Storm Freya was not as bad as predicted. Your flowers are beautiful and the birds too, so different from what we see here DownUnder! Lorrie - nature is resilient … I was out shoveling the path to our front door today (we normally use the side door but I am expecting visitors later in the week) and we easily have four feet of accumulated snow. It got me to thinking about all the plants and shrubs and seeds that are buried under there, just waiting for spring. Little things that have gladdened my heart? Bright sunshine which makes it feel warmer than it really is. Spring flowers on my mantle. Seeing a little brown bunny in my backyard this morning. And having you as a participant in Mosaic Monday! Enjoy the rest of your week. Sorry to hear that Tim came home with a cold. The carrot soup sounds like just the thing to restore him to good health. Your new camera sounds great and ideal for your upcoming trip. Great photos of the birds in your area. Happy new camera! photos, the robing is stunning clear. Hope by now you've figured out all the passwords for the new phone. My sister used her I-phone instead of a camera on her last trip to Europe. I don't think I could manage doing that. I still need to use a camera camera. :) Hope Tim's cold is better by now, too. Lovely photos! I'm excited for you for a trip to Europe coming up. I have taken my camera and phone and it's frustrating to sync the photos later, but it helps to have the dates, of course. This last time I ended up using mostly my phone. Agh! It's not bad, but could be better. Cyclamen's heartiness in chilly weather surprises me. I've had a pot of pink cyclamen sitting on the front stoop since December. As long as I water them, they've stayed pert and pretty. Your carrot soup sounds perfect for those under-the-weather. And your birdy portraits are wonderful. Your pictures are stunning! That first one with the flowers was so colorful, it just made my heart happy. And then such good captures of the birds. What nice pictures you take with your new camera. I have a small Canon I carry in my purse all the time, but I really love the results you are getting. You'll get the hang of your new camera easily and your photos will be amazing as always! Glad you got your new phone. We never buy every two years, and only upgrade when its needed. Then, like you, not to the latest and greatest. I do use my phone for everything though! Amazing bird photos, Lorrie! And your flowers are wonderful too. It's snowing wet snow at the moment, but spring is clearly coming, the days are becoming longer fast. Another gladdening thing could be a saintpaulia that I bought yesterday in the supermarket. Its bicolour flowers are really pretty. I just inherited my daughter's phone last weekend when she got a new one. Hers is newer than my old one,, and my tech savvy son-in-law transferred my info over into the new phone. But signing into accounts again really is a chore. Trying to remember all those pesky passwords is the bane of life in the 21st century. Also, getting used to the new-to-me model phone and personalizing it the way I like it... Love your photos. Your soup sounds delicious. And I hope your husband is feeling better. I inherited my son's I-phone last summer. I'm still trying to get used to it. I used to be pretty tech savvy but I seem to have lost my edge over the years. I'm sure you will get some great photos on your trip. Love the bird photos and what a lovely sight to have flowers blooming already. Too cold here yet. I hope your hubby feels better soon. Have a wonderful weekend, Lorrie. Late to the party, as always. But I promise to be a better blogger again now. I love those signs of spring, the colours are glorious. I am looking around my own patch and see tiny harbingers here too. The weather is grey, very windy and overcast, not such a bright world as the one you show. Soon, soon. . .
Lorrie, you are such a techie! I'll never catch up. I don't know how old my cell phone is, but it's pre-smartphone--and I hope it lives forever! I have an old iPhone (5) , Lorrie, and need to get a new one, but haven't taken the plunge yet. How nice to have a trip planned for the summer. Hope your hubby is feeling better by now. Your soup and white chili sound comforting. Would you believe I got a new I phone as a gift for Christmas and have not set it up yet, maybe this week!Your photos are spectacular, the new panasonic camera sounds great too. So happy your Dh is feeling better, soup especially with ginger and lemon tea certainly help. Lovely to see your flowers and bird photographs.